"Welllll. Do you have a blueberry rake?" Dave asked. Dave is an ideas guy. But he's also one to plan, lead and follow through, often leading me to wonder where he finds the time. Since bird hunting with him last fall (he's a Registered Maine Guide, among many talents, and no small feat), he's become a dear friend, and something of an adoptive Maine Dad and benefactor. He generously shares his time, advice, connections, family and friends, and deep knowledge of all things Maine. 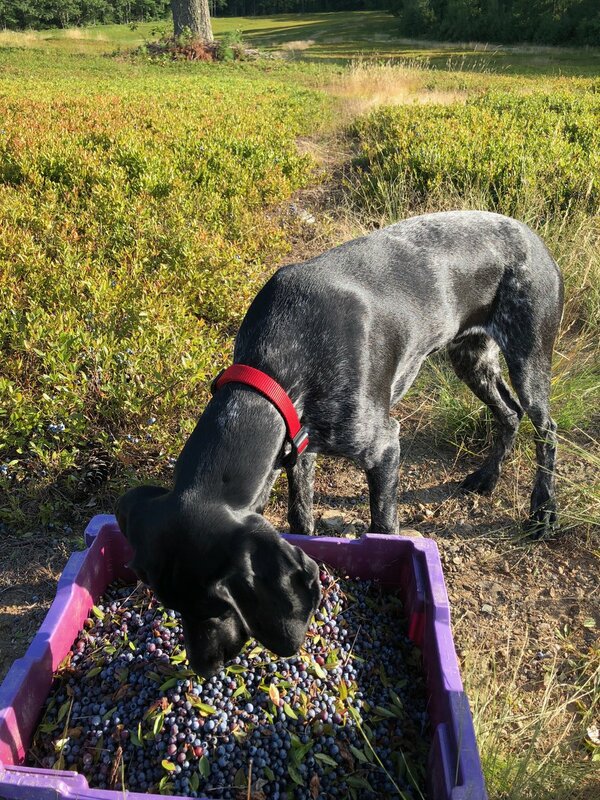 "If you’re going to pick wild blueberries, you are going to need a rake. Let me see if I can find an extra one. There are some great fields up by my family’s camp"
"Of course!" I'd actually been dying to get out there, but we didn't know where to go. I almost said no. How could we go? There are no days off during the summer in our business. But life here is deeply seasonal; when the berries are ripe, you pick. So, of course, I said, "we're in!" Dave, showing me how it's done. Being "from away," I had never seen a blueberry rake, but I discovered that it's a unique tool that looks like a metal shoebox attached to a long, fine-toothed comb. With blueberry season’s days numbered, and considering this our last opportunity of the year, we had to maximize the harvest. I knew exactly who to call: Amy and Toby, of Old Narrow Gauge Farm, who are active foragers and friends, and know just about every edible to look for, and when. As usual, they were happy to oblige. So we swung by their pig farm in Alna on the way, and continued up to Whitefield to meet Dave. "The season has pretty much passed," Amy, said "but you might find enough berries to make some jam." Just some jam would be good enough for us. After all, we were in it for the experience. Once we learned what to do and when, we could get serious next year. They equipped us with everything we needed: two beautiful vintage rakes, a stack of plastic flats and two five gallon buckets. All told, enough for about 100 pounds of berries. Just in case. A borrowed rake makes short work of the picking. Even though I’d visited Maine for 15 years, and have lived here for about a year, I had never been to Whitefield. The beautiful route there wound past rolling hills, twisting fields of crops, and cows, horses, alpacas, and sheep. Dave had told us to meet at "the general store." A quick Google search directed us to the Sheepscot General Store and Farm. This historic farm and store fell into disrepair over the years until a few years ago when a young couple came home to Whitefield and breathed new life into it. Now, it serves as a hub for local food and community. Beautiful stories like theirs continue to inspire and delight us as we settle down here. The store’s shelves stock fresh produce, local products, handmade clothes, and some essential provisions. There’s a cute café inside serving up those same delicious ingredients. Dave was nowhere to be seen, so we decided to fuel up for our day of picking. Time slipped away sitting on the back porch overlooking the fields, nibbling on reubens with homemade corned beef, and sipping glasses of beer and kombucha on tap. "It was worth the drive for this meal alone," I said, between bites, to Stuart. The reuben with homemade corned beef and beer and kombucha on tap at the Sheepscot General. Once we came to and checked the time, Dave’s absence worried us. We called him and discovered we were at the wrong general store. He had been waiting at the superette down the road which, confusingly, used to be called the general store. Dave's roots, we soon discovered, run deep in this town. And that store, he told us and later showed us in a picture tacked to the fridge at his parents' camp, was across the street from the town's original general store, which his great, great aunt had owned and run. Our next stop was a visit to Dave's cousin Mary who now lives in his mother's old house. Dave's mother recently passed away, and I wondered how raw his grief might still be. I instantly noticed Mary's lush and meticulously weeded gardens and the baskets in her kitchen overflowing with state fair-sized squash, ripe red tomatoes and garlic. I remembered how Dave had asked me so many times last fall, "did you get your garlic in?" I had not. "Over there," Dave said, pointing to a large field across the street, "my grandfather had his garden. There's some horseradish somewhere, and blackberry bushes down at the end. We can can pick those after the blueberries." Living so far away from and disconnected to my hometown in West Texas, I tried to imagine what it would feel like to be so connected to a place. "One thing at a time," said Mary, bringing Dave's characteristic enthusiasm back down to earth. Talk soon turned to gardening, and from there, naturally, to cooking. We already knew Dave is a wonderful cook. It turns out most of his family is, too. In different ways, they've continued the traditions of farming, hunting, foraging and cooking from this land. When we pulled up to the field to harvest, I couldn't immediately tell what it was. Dave ushered me closer, and I saw that the rolling field was carpeted with dense low bushes bursting with ripe berries, all for the picking. Dave gave me a quick tutorial, and then we were off to work. We filled bucket after bucket, flat after flat. After a while, I needed a break. Apparently, blueberry harvesting, with it's crouching and bending, isn't the best pregnancy activity. Right before Comet plunges in for a big bite. Comet, all hopped up on berries. I checked on Comet, who by now was sleeping soundly in his kennel, all tuckered out from running wild through the fields and gorging on berries when I wasn't looking. Then I strolled through the cemetery on the hill above the field, reading names and dates etched in granite through the slanting late afternoon light. I stumbled upon a stone that read 'Giampetruzzi,' Dave's last name. It was his father Nino's tombstone. I hadn't realized he was buried here, but it made sense. I noticed someone canoeing on the placid lake below; wind rustling the leaves. Next to Nino's name and dates was his mother's name - Roberta - but the date of her death had not been filled in. She wasn't buried there, although it had been several weeks since she passed away. Dave later explained that the interment would be held on her birthday, in October. When I made it back to the car, I discovered we'd filled all of our flats and buckets. Dave was not far behind. We sat on the bumper and he told me he probably knew most of the families whose names were on those stones. We collected Stuart and stopped back by Mary's so she could show us the ingenious system she devised for cleaning berries without a winnower. As a parting gift (as if she and her family hadn't yet bestowed enough gifts), she gave us a handful of garlic that Dave's dad had grown that they think his family had probably grown before that in Italy. In turn, we left her with all we had to offer: blueberries. Mary demonstrates her ingenious berry cleaning technique. Driving home in the dark, we soon realized we would be up all night cleaning our berries by hand, and we had to get an early start on work the next morning. Luckily, Amy called and insisted we stop by to use their winnower. We hadn't wanted to bother them so late and we were already close to home, but when she told us it would only take 10 minutes, we couldn't resist. When we pulled back into their driveway, they greeted us with their headlamps on and truck lights illuminating the running machine. As she said, it took all of about 10 minutes. As we got in the car to head home, Amy filled my arms with their freshly harvested corn and special white cucumbers. As if they hadn't already given us so much! Amy and Toby helping us clean our berries by headlamp with their winnower. This kind of generosity, shown by Dave, Mary, Amy, Toby and so many other friends and neighbors (and even complete strangers) is one of the reasons we've fallen so deeply in love with our new home. While we will never get to call ourselves Mainers, after a day of harvesting 100 pounds of wild blueberries and experiencing an immeasurable amount of generosity, we're starting to feel at home here in Maine. This recipe is adapted from Cookie and Kate's raspberry muffin recipe. It makes such tender and tasty muffins, you can barely tell that they're healthyish. Here, I use coconut oil for the fat, something I've been loving lately in baked goods, and maple syrup instead of sugar. Yogurt, in my opinion, is the best dairy for muffins. You can use whatever berries you have on hand, whether fresh or frozen. If frozen, don't defrost, just toss with a little flour before folding them into the mix. Preheat the oven to 350 degrees F and place a rack in the center of the oven. Grease a muffin tin and set aside. Whisk together the flour, baking powder, baking soda, salt and cardamom in a large bowl. In another bowl, whisk together the maple syrup, coconut oil, eggs, vanilla extract and lemon zest. Fold the wet ingredients into the dry ingredients until almost combined (some streaks should remain). Gently fold in the blueberries until just combined. Don't overmix. Using a large cookie scoop, scoop the batter in to the prepared tins. Sprinkle the top with raw sugar. Bake until golden and springy when pressed, about 24 minutes. Making fresh pasta intimidates many of us, but it doesn't need to! With just a few ingredients, some elbow grease and a little patience, you'll be putting homemade pasta on your dinner table in no time. But fresh pasta can be so wonderful because of its rich color and flavor, and its tender, silky texture. Of course it's more work than opening a box, but if you have a moment, it will be worth the effort. And playing with your food can be fun. I was once told (and completely agree now that I have some experience), that the key to great handmade pasta with a beautiful texture is to knead it for a full 10 minutes. And I mean athletic kneading, not just poking and prodding. After all of that kneading, which works the gluten, you'll need to be sure to let the dough rest so the gluten can relax. Work out; cool down. Making handmade past does take some work and patience (like most good things in life), but it's worth it. Mound the flour on a work surface and make a well in the center. Add the eggs, olive oil, water and salt to the well; whisk with a fork. Bit by bit, stir in the flour with the fork, working from the inside and moving out. Once the dough starts coming together, form it into a ball. Transfer to a lightly floured surface and knead vigorously until smooth and elastic, about 10 minutes (set a timer!). Add a little flour as you go if the dough is too sticky. Cover and let rest for 30 minutes. On this summer solstice afternoon, light pours in through the window. The scent of peonies wafts toward me from big garden blooms in shades of pink and white. Each summer solstice, S and I also celebrate our wedding anniversary. We usually do this by preparing an elaborate meal we've never cooked before. This year, we're thinking of something a little simpler since we're so busy, with ingredients we have on hand. We want it to be something we can cook on our fire pit down by the river so we can enjoy every bit of daylight on this longest day of the year. We'll probably just make some tacos with grilled skirt steak we had stashed in the freezer along with some greens, onions, radishes and cilantro from the garden. We'll pop open a jar of tomatillo salsa from last year, too. Each year we also treat ourselves to a fancy restaurant meal another night of the week. This year, we had a magical evening at the Lost Kitchen in Freedom Maine. Erin's food was thoughtful and delicate; the ambiance warm and convivial. What a treat. For dessert this evening, I decided to do something a little fancier since I knew dinner would be simple. I wanted to use rhubarb since we have too much of it in the garden right now. And I wanted something I could make ahead then forget about. While we've made tacos countless times, we've never made these little rhubarb cakes, so we haven't broken with tradition. Sweet, tart, cool, creamy -- I think they'll make the perfect solstice treat. For the crust: Preheat the oven to 350 degrees F. Wrap the bottom of each of four 3.5-inch ring molds with tin foil and place on a baking sheet. Whisk the all-purpose flour, almond flour, sugar and salt in a large bowl. Add the butter and rub into the flour mixture with your fingers, leaving some pea-sized pieces of butter. Whisk together the yolks with 1 tablespoon cold water in a small bowl. Add the yolk mixture to the dough and mix to combine. Knead a few times in the bowl to bring the dough together, then turn out and knead a few more times. The dough should be sticky. Divid the dough into 6 pieces. Press a piece of dough into each of the prepared ring molds. Shape the remaining 2 pieces of dough into large rectangles (to make shortbread cookies with the extra dough) and place on the baking sheet alongside the ring molds. Prick the dough all over with a fork. Freeze until firm, about 30 minutes. Bake until golden brown, about 40 minutes. Let cool. For the mousse: Place the gelatin in a bowl with ice water and set aside until gelatin softens, about 5 minutes. Bring 1/2 cup water to a simmer in a small saucepan. Turn off the heat. Remove the gelatin from the bowl and squeeze out the excess water. Add the gelatin to the warm water and stir to dissolve. Let cool to room temperature. Add the yogurt and powdered sugar to a large bowl; whisk to combine. Whisk in the lemon zest, juice and almond extract. In another bowl, beat the cream until soft peaks form. Gently fold the whipped cream into the yogurt mixture. Divide the mousse among the 4 pastry rings. Freeze until firm, about 2 hours. For the rhubarb wrap: Line a baking sheet with paper towels and set aside. Using a mandolin or vegetable peeler, slice the rhubarb into paper thin strips. Place the sugar in a saucepan along with 1 cup water. Bring to a simmer and stir until sugar dissolves. Dip the rhubarb strips into the simmering water until soft, about 30 seconds. Reserve the rhubarb-infused syrup for cocktails or pancakes. To assemble: Unmold the chilled cakes. Lay some rhubarb strips on top of the cakes, pressing gently to attach. Trim the edges. Wrap a strip around the top of the sides, covering any overhang. Continue to wrap strips down the sides. Brush the cake all over with a little of the reserved syrup. Spring! It was slow to arrive this year, but we're so grateful it's now in full swing. It's been hard to find the time to post here these days. Between settling into our still new home, running a new business, teaching cooking classes, gearing up for the busy season, getting our garden up and running and taking care of a little puppy, there hasn't been a lot of free time. On top of all that, we have some exciting news to share: we are expecting a baby boy in November. We feel so blessed. Now that the nausea has (mostly) subsided, I'm ready to jump back into the kitchen. But our priority right now is the garden. We're so behind! And we've got to get it in shape before the guests descend this Memorial Day weekend. To that end, we've built the raised beds for the kitchen garden (thanks to the help of our dear friend David). Our chicken coops are in progress (also thanks to David) and our early season crops are in the soil. Our new raised beds for the kitchen garden. Comet, "helping" in the garden (right before he started eating my kale seedlings). Our puzzle now is figuring out where to plant the fruit trees, shrubs and flowers we ordered from FEDCO. It seemed like such a good idea back in January, but now I realize I know absolutely nothing about landscaping. We're constantly learning. The chicks will arrive any day now, so we're brainstorming how we'll train our bird dog not to hunt them. And then there are the hawks, eagles and foxes to contend with. We're continuing to prepare a huge, overgrown garden plot our neighbor Ronnie has so graciously allowed us to farm this season. We're so grateful for the many ways our neighbors continue to welcome and supported us. Overgrown garden plot, ready for weeding, double digging and amending. We're so excited that soon (we hope) we'll be able to share our garden bounty through the meals we cook for our guests and friends, bringing us one step closer to our vision. Of course, we still look forward to continuing to collaborate with our farmer and fishermen friends. After seemingly endless weeks of dull root vegetables and preserves, fresh spring greens and new vegetables varieties have started to appear on the tables of the farmers market. Right now, I'm still cooking with winter staples but have started to fold in the newcomers. This captures this culinary transition. The key to this salad is to season each component before you plate with dressing, salt and pepper and plenty of lemon juice to brighten it up. I realize this post is heavy on life and light on food, but I'll be spending more time in the kitchen now, so expect more recipes soon. Place the beets in a baking dish and add a little water to the pan. Cover and roast until the beets are tender when pierced with a knife, 45 minutes to 1 hour, depending on the size of the beets. Make the "dirt." Place the stale bread in a food processor and pulse until coarse crumbs form. Don't over-process or you'll end up with powder. Heat a skillet with the bacon drippings or oil. Toast the bread crumbs until fragrant and golden. Season generously with salt and pepper. Remove from the heat and set aside. Spoon some "dirt" in rings on dinner plates. Toss the beet wedges in a bowl with some dressing, lemon juice and salt and pepper. Arrange on the "dirt." Toss the greens in the same bowl with some dressing, lemon juice and salt and pepper. Arrange with the beets. Sprinkle pieces of cheese around the beets and greens. Top with edible flowers, if using. Here we are, in the depths of winter. We've endured seemingly endless days of gray. We've seesawed between cold snaps and unseasonable warm spells--bearing witness to a changing climate. We've felt helpless in the face of senseless acts of violence, outraged by the racism that has reared it's ugly head, and frustrated with pervasive political impotence. But there are rays of hope--young people speaking out against gun violence, #metoo moments and #blacklivesmatter, to name a few. And there are reasons not to fill with despair, namely, that it ruins our appetite for change. The task is endless, it's true. But we are here to pursue it. I do not have enough faith in reason to subscribe to a belief in progress, or to any philosophy of history. I do believe at least that a man's awareness of his destiny has never ceased to advance. We have not overcome our condition, and yet we know it better. We know that we live in contradiction, but we also know that we must refuse this contradiction and do what is needed to reduce it. Our task as men is to find the few principles that will calm the infinite anguish of free souls. We must mend what has been torn apart, make justice imaginable again in a world so obviously unjust, give happiness a meaning once more to peoples poisoned by the misery of the century. Naturally, it is a superhuman task. But superhuman is the term for tasks men take a long time to accomplish, that’s all. Let us know our aims then, holding fast to the mind, even if force puts on a thoughtful or a comfortable face in order to seduce us. The first thing is not to despair. Let us not listen too much to those who proclaim that the world is at an end. Civilizations do not die so easily, and even if our world were to collapse, it would not have been the first. It is indeed true that we live in tragic times. But too many people confuse tragedy with despair. “Tragedy,” Lawrence said, “ought to be a great kick at misery.” This is a healthy and immediately applicable thought. There are many things today deserving such a kick. I know. You're probably thinking this is a little heavy for a frivolous food blog. And, of course, it's true. But it's also true that food is political, whether we like it or not. How it's grown and processed, by whom and under what conditions, who has access to what, and who goes hungry. It's said that food is the one thing that unites us all. It has the ability to bridge barriers, nurture community, and, in the words of cook and author Julia Turshen, to "feed the resistance." I don't have any answers here, I can't promise any magical food cures. Instead, I have for you a simple recipe that I hope will brighten your day with a burst of citrus in the midst of winter and offer a small reminder that life, though sometimes nutty, can be sweet and shared with love. Preheat the oven to 350 degrees C and place a rack in the center of the oven. Heat 6 tablespoons of the sugar with 3 tablespoons water in a 10-inch ovenproof skillet over medium heat stirring until sugar dissolves. Bring the sugar to a boil and cook until a light golden caramel forms. Occasionally swirl the pan during the part of cooking, but be sure you don't stir it or the sugar will crystalize. Remove from the heat and stir in 2 tablespoons of the butter. Remove the ends of the oranges. Slice very thinly, about 1/8-inch thick. Arrange the slices in concentric circles over the caramel, starting on the outside and working your way in. Whisk the flour, cornmeal, baking powder and salt in a medium bowl. In a stand mixer fitted with the paddle attachment, beat 3/4 cup of the sugar with the remaining 6 tablespoons butter until light and fluffy. Beat in the almond extract and eggs, one at a time. Add the flour mixture in 3 additions, alternating with the buttermilk. Mix just until combined. Drop the batter onto the orange slices and spread gently with an offset spatula. Bake until a cake tester comes out clean, about 30 minutes. Cool the cake for 10 minutes in the pan. Run a knife around the edge, then invert the cake onto a platter.